…the NBA announced that it would not hold its 2017 All-Star Game in Charlotte, N.C. because of a controversial state bill requiring transgender people to use school and government bathrooms that conform to the gender on their birth certificates. As noted last Friday, the City of Raleigh prohibited LGBT employment discrimination by contractors doing business with the city. Charlotte, the state's largest city had a comprehensive nondiscrimination ordinance protecting LGBT citizens from discrimination in housing, employment and public accommodations. In January, 2015 the city of Greensboro amended its Fair Housing ordinance to prohibit LGBT discrimination. At the same time the city codified a nondiscrimination policy in city employment. The state's largest employer, the University of North Carolina (the state university system) protected 35,000 employees from discrimination on the basis of sexual orientation or sexual identity. The same protections wer extended to nearly 250,000 students. There are, or were, other nondiscrimination laws across the state, mostly in urban areas. All of those protections are gone! 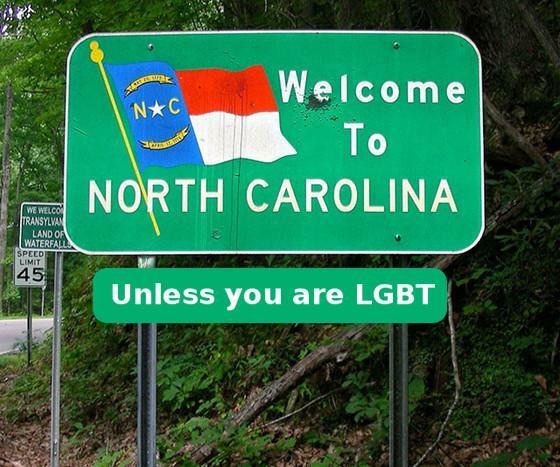 HB2 effectively nullified all nondiscrimination laws in effect by any political subdivision. Yet somehow, whenever the media writes about the problem in North Carolina we get the bathroom dialog. Don't get me wrong. Protecting transgender people (particularly transgender kids) by allowing them to use public restrooms consistent with their gender identity is extremely important. It's just not the full story. If you see it or hear it—correct it. If you read or hear something that is inaccurate, try to contact the author or speaker. If that's not possible then contact the program or the media outlet.